What do you do when a friend borrows your banjo, then completely ruins it, its nuts and bolts spilled all over the ground? Whip out your ukelele of course. 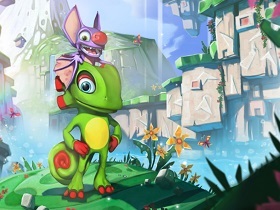 The core team behind Nintendo 64 era 3D platformers such as Banjo-Kazooie have started up a new property in the same vein as the bear and bird duo, this time featuring a chameleon and big-nosed bat, Yooka and Laylee, who together will star in Yooka-Laylee. Funding and hype behind this project reached high levels relatively quickly, and now the kick-starter launched just days ago has reached over a million pounds, with 45 days to go. The development team was clearly taken by surprise as a lot of their larger pledge packs with limited space sold out quickly, to which they found themselves adding more with tags of "Due to popular demand". By hitting this benchmark, Playtonic games indicates they will be releasing the game on all platforms (PC, Linux, Wii U, X-Box One, Playstation 4) on launch day, slated for the Fall 2016. They've now added stretch goals beyond the £1 million mark. As for Kickstarter, it made it to the goal in less than an hour I heard. And right now as I'm writing this, it's about to hit 2 million USD! My criticism only seems to be this: I hope there will be natural lands in other worlds. I'm not much of a fan of the thick grass ledges or blocky rocks forming under them. I wonder if it's an aesthetic purpose for the whole game? Or it's going to be more similar to the different themes for each world from Banjo Tooie? Nah, that would be the editor, the only link I put in was the one to the kick starter. No, I just copy-and-paste everything, but forgot to copy and paste the correct url into the code. Looks like GR fixed it, though. As for Kickstarter, it made it to the goal in less than an hour I heard. ArsTechnica has it at 40 minutes. Not bad! I'm supporting this game at the thousand dollar tier because the developers are literally my gaming heroes and being able to talk to them one-on-one in a video conference is too good to pass up. Hopefully they will be able to deal with this better than some people who ended up with more money than they expected. 40,000 people to put in the Thank You section of the credits. 15 people to do guest voice overs in the game. Although I've signed up too, I'm also wary. My experience with "Starbound"'s very successful fundraising was that they released a very incomplete game late and have been less than diligent in getting to v1.0, because hey, they had millions of dollars to burn and they'd bitten off more than they could chew in terms of stretch goals. Even the platformer "Freedom Planet", which did deliver a polished game about on time, still hasn't followed through on some of their promised extra content. "Yooka" has already promised minecart levels, local multiplayer, co-op multiplayer, a quiz show level, translations &c, and they're about to promise unspecified DLC. So, all this funding for Yooka might actually slow development.